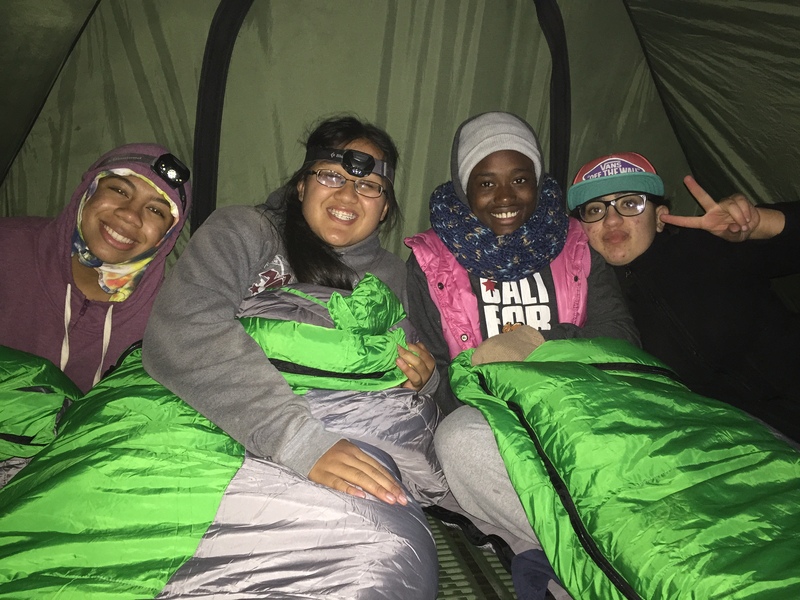 Olive Tambou was shaking when she set up her tent for the first time, on a middle school field trip in Yosemite. She was terrified bears might visit her overnight, but camping beneath massive pine trees changed her life. Tambou is originally from Cameroon in Central Africa, and her family traditionally doesn’t spend much time outside. Now she takes a bus twice a week from her home in Visitacion Valley to the Golden Gate National Recreation Area (GGNRA). Walking along the San Francisco Bay shoreline at Crissy Field, Tambou says she doesn't mind the three-hour round trip. "I love going to parks!" Tambou exclaims, as she spreads her arms to the sky. 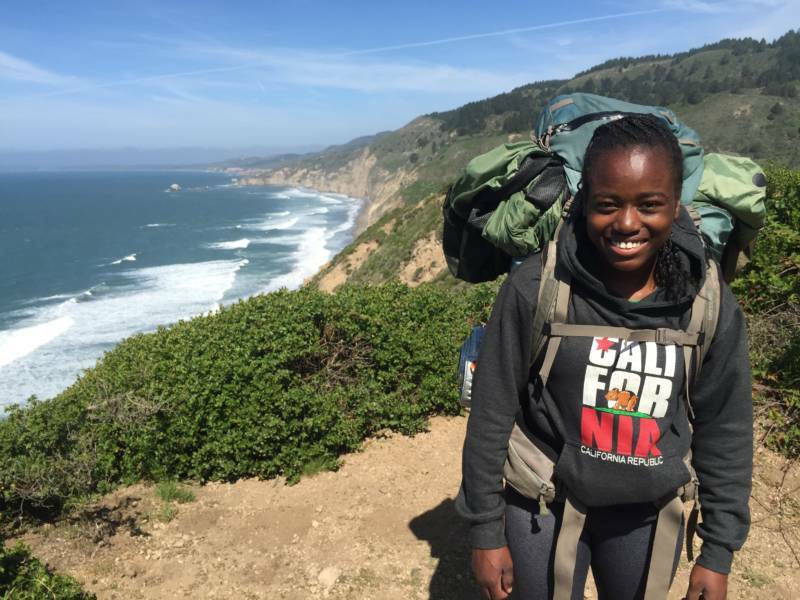 She's part of a high school internship program designed to inspire people of many ethnic identities to care about national parks. Last year, our country’s most scenic parks and cultural monuments drew more than 300 million visitors, but most of them fell in the U.S. census category of "White, non-Hispanic." 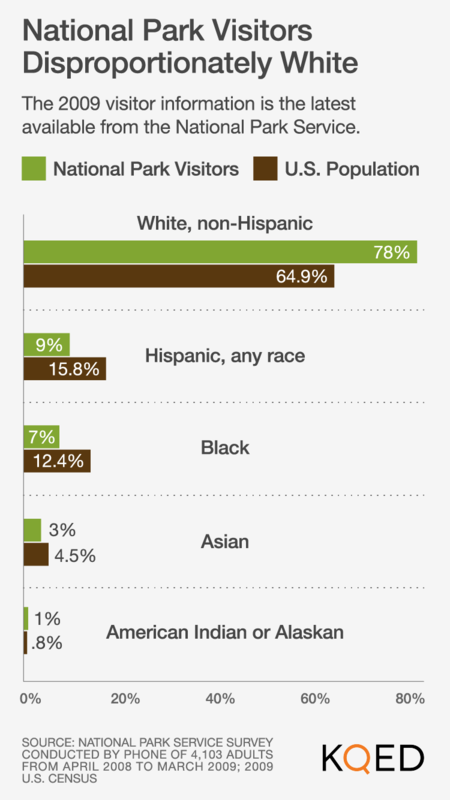 The most recent nationwide visitor survey in 2009 showed that only one in five tourists was a person of color. Yet the nation is about twice that diverse. “They don’t feel a sense of connection," says Nina Roberts, professor at San Francisco State University. "They just don’t feel that relationship." Roberts researches race and culture in outdoor recreation. She says the parks have struggled to welcome people of all backgrounds. Roberts says the parks need to make changes that would show people of all backgrounds they’re welcome. The National Park Service does preserve places that are historically and culturally significant to many peoples. Think of the birthplace of the farmworker movement in California, Aztec ruins in New Mexico, and an African burial ground in Manhattan. 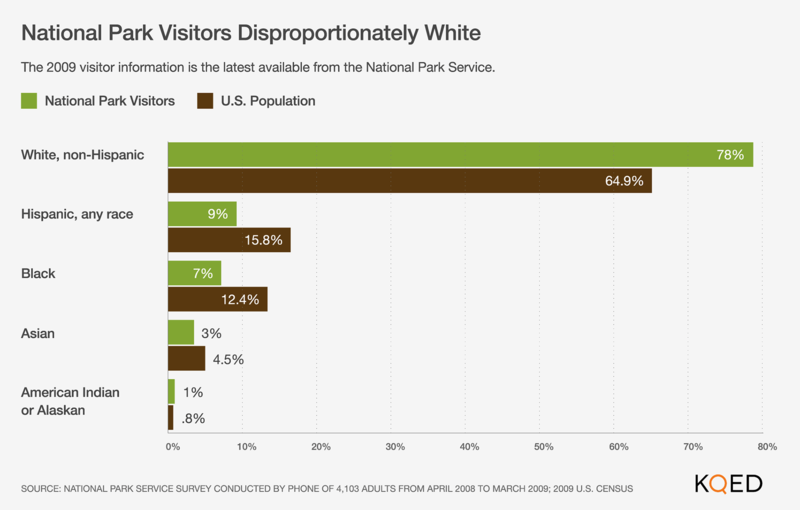 But across the system, most park employees are Caucasian. The uniforms make rangers look like immigration officials. And, Roberts says, many African-Americans, particularly elders, fear the outdoors and carry the scars of slavery and lynchings. "What people do for leisure, historically, was not spending time in the outdoors," Roberts says, "because they worked in the outdoors or they were killed in the outdoors." Park Service leaders are aware of these barriers and, since the 1970s, they've been trying, somewhat unsuccessfully it appears, to increase diversity to catch up with the country’s shifting demographics. During that decade, Congress created the country's first urban parks — GGNRA was one of them — and one goal was to attract minorities and low-income people to parks that were closer to cities, so people didn't have to travel for hours to experience a national park. Longtime San Francisco activist Amy Meyer remembers a heated Sierra Club meeting one night in the early 1970s, when a woman from Chinatown spoke confidently to the group of white activists discussing land preservation. On October 27, 1972 Congress established both the Golden Gate National Recreation Area and the Gateway National Recreation Area in New York City. It was the beginning of a wave of urban parks, such as the Santa Monica Mountains in greater Los Angeles, and the Cuyahoga Valley near Cleveland. Today you can visit a national park site in 40 of the country's 50 most populated cities. Over the years the Park Service has tried numerous outreach programs such as summer camps and free days, designed to attract people of color. 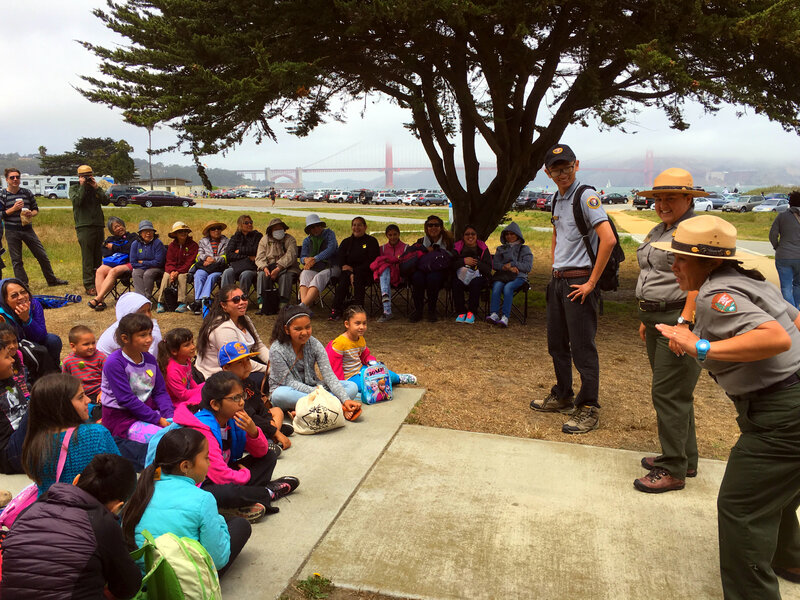 Currently, GGNRA is offering free shuttles to the park every Saturday from designated libraries in the Bay Area. But the parks have stumbled occasionally in their outreach. For example, youth programs used to accept students on a first-come, first-served basis. So for years, the programs filled with white kids from private schools who had savvy parents. In another example, inner city kids are often recruited for beach clean-ups. So their first experience with the outdoors is picking up someone else's trash. And there are subtle ways the park has discriminated. “At a local park here in Washington D.C., for a time, the only signs in Spanish were "No drinking allowed in the park,'" says Alan Spears, director of cultural resources with the National Parks Conservation Association. Spears says the marketing to people of color hasn’t worked. The message has to change. Help in protecting the park’s future. By 2050 whites will no longer be the U.S. majority. So Spears says minority votes will be increasingly important. "Every session of Congress," he says, "we get someone who thinks it would be a good idea to sell off a portion of a national park in order to put up an outlet mall or something else." And it's not just votes to preserve wild lands. It's votes to preserve the places that tell the stories of all Americans. To that end, the NPS has published a Call to Action which outlines priorities for the organization's future. It states: "In our second century, we will fully represent our nation's ethnically and culturally diverse communities."